It goes where others can’t. 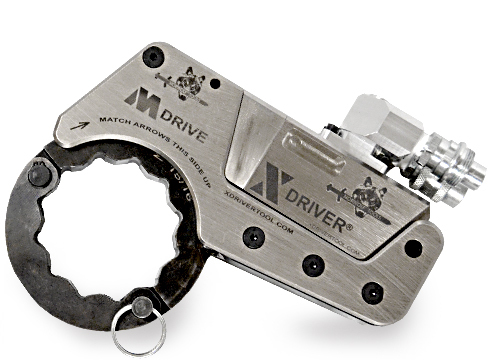 The M Drive is a special application tool for hyper-low clearance applications like BOP’s. It has no holding pawl, is lightning fast and has the flattest drive width in the X Driver family. There are no roll pins. A longer lever arm allows for a 40 degree stroke, which is what gives the hex link it’s amazing speed. 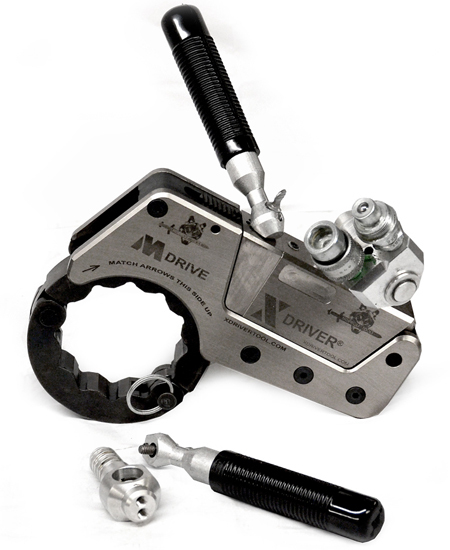 The M Drive is specifically made for the tightest BOP applications (such as a 7” 10m) where no others can fit. • Fastest… 40º stroke… most accurate with sliding keyways. • Absolute thinnest… patented totally enclosed system… no exposed teeth. • Available in ratchet, spanner or split link design. • Easiest to use… snaps right in… fits in only one way. 1) A totally enclosed ratcheting hyper low-profile hex link. 2) A non-ratcheting spanner link.